Built to be a weekender by W B Dalley the revered Manly politician and lawyer, the premises was a quiet reclusive place with a creek, palms and ferns and lawns that ran down to the beach. Throughout this weekender's cottage and holiday house status, it has been the beauty of the garden's grounds and beach it resided beside that were emphasied by anyone speaking of Bilgola cottage and house. Dalley's tenure and enjoyment was short lived though as he passed away 28th of October 1888. The property had already been placed on the market in January 1888, so it may have been built to be sold or Mr Dalley, said to be heartbroken when his wife Elanor died of typhoid in 1881, leaving him to look after their six children. Mr Dalley retired from public life for a few years, came back and built a castle at Manly and a cottage at Bilgola. In 1887 he became quite ill and may have sensed putting his affairs in order was sensible. when W B Dalley made his will on 18 November 1887 he stated that ‘my residence at Manly and my property at Pittwater known as Yellambi may be sold..’ There was no mention of any property called ‘Tallamalla’, the name under which the Bilgola property was subsequently offered for sale. The reason for the discrepancy is unknown..
From MW&PHS, Bilgola. Peninsula Historian Newsletter. VOLUME 3 NO. 9, SEPTEMBER 2010. George Champion. Edited by Tony Dawson. Above: Southern Headland 1913. Pic No: a3292031h from The Allen Family Album No 63 and courtesy of the State Library of NSW. Above: A path through the grounds, 1913. Pic No: a3292011h from Allen Family Album, courtesy State Library of NSW. From MW&PHS. Bilgola. VOLUME 3 NO. 9, SEPTEMBER 2010. George Champion. Edited by Tony Dawson. By Col. Watts time the property had shrunk from its original 18 acres to 6; This firm will next Thursday offer at auction In their rooms a number of properties, including Bilgola, the week-end home of the late Mr. Oswald Watt, at Pittwater. This is a charming home, with about six and a half acres of land, laid out in garden, lawns, and groves, for which there has been good Inquiry. There was further subdivision planned by the new purchaser Harry James Brigden brought the property and subdivided it and placed twenty eight lots on the market by February 1922. Hannah Maclurcan, proprietor of the Wentworth hotel, and Robert Lee, who listed his occupation as ‘gentleman’ purchased most of these. Hannah was a self-made lady whose very popular cooking book, cited by some as the first example of Australian recipes, ran to several editions. 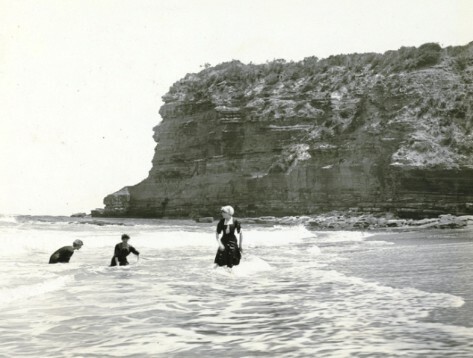 View of Bilgola Beach from hill, Sydney, New South Wales, 1930 - Image No. : nla.obj-147289233-1, courtesy National Library of Australia. In May 1928 Hannah and Robert advertised an intent to purchase and reclaim 6 perches below the high water mark From early in the 1930’s the proerty was advertised for rent as a Holiday Rental or at the end of summer and even in October, 1932. It is described in these ads as having 3 bedrooms or two large bedrooms and a maid’s room, a living room, sleepout verandahs and shower room in later ads. At first beautiful furnishings, cutlery and linen are included. By October 1932 it is not and Hannah has the placement of a rental being attended to by others. BANKRUPT CHARGED. Large Sums Mentioned. Robert Lee, of Bilgola House, Bilgola Beach, Newport, appeared before Mr. Laidlaw, C.S.M., at the Central Sumons Court on two charges under the Bankruptcy Act alleging fraud. The death occurred on Sunday, at St. Vincent's private hospital, of Mrs. Hannah Maclurcan Lee, formerly gov-erning director of the Wentworth Hotel, Sydney. She was 73 years of age. Mrs. Maclurcan Lee, who was better known as Mrs. Maclurcan, went to Sydney in 1901, when she bought the Wentworth Hotel— with 30 rooms and an unpopular name, she once said. She herself did all the cooking for two years with only the help of two Chinese boys in the kitchen. The venture was an unusually large business undertaking for a woman in those days, and when, in 1912, the Went-worth Hotel was formed into a limit-ed liability company she became gov-erning director — a position she retain-ed for more than 20 years. During that time she bought land on each side of the hotel, and remodelled and rebuilt until she had a modern Hotel. A daughter of Mr. A. Phillips, of Brisbane, who owned a number of hotels, Mrs. Maclurcan gained a thorough knowledge of the business at a very early age. Her father put her into the kitchen of his hotel at Townsville, and she worked through the dining-room to the office, until she knew how to organise and manage. When her chefs refused duty at the Wentworth Hotel some years ago, she locked the gates on them and took on new men. When she was only 15 years of age, her son, Mr. Charles Maclurcan said, she was manager, for her father of the Club Hotel in Too-woomba. "Hannah did not work for her father in Townsville when she was 15 (1875). Her father never ran a hotel in Townsville. From 1861 to 1870, he was based in Toowoomba from where he moved to Brisbane. In 1875, he put her to work in his hotel in Sandgate. Hannah did not work in Townsville until 20 years later when she and my great grandfather ran the Criterion Hotel, later to take over the Queen's." Here is just one of the references which confirm this. Sunday, 27th November, 1921 – Sunday Times: Mrs. Maclurcan is pictured to-day. She is so well known in Sydney's social and business circles that she scarcely needs an introduction. She started her remarkable business career with her father, and actually managed his hotel at Sandgate when she was 16. Mrs. Maclurcan has a remarkable gift for organisation, as anyone who has been concerned in charity functions at the Wentworth Cafe will testify. The functions arranged under her direction give so little trouble to the executive members that they can enjoy the parties just as heartily as the patrons who have not helped in getting them up. Mrs. Maclurcan goes abroad periodically to glean new ideas for the running of the cafe. She is now directing the enlargement of the beautiful ballroom, and expects it to be in readiness for the Christmas and New Year celebrations. 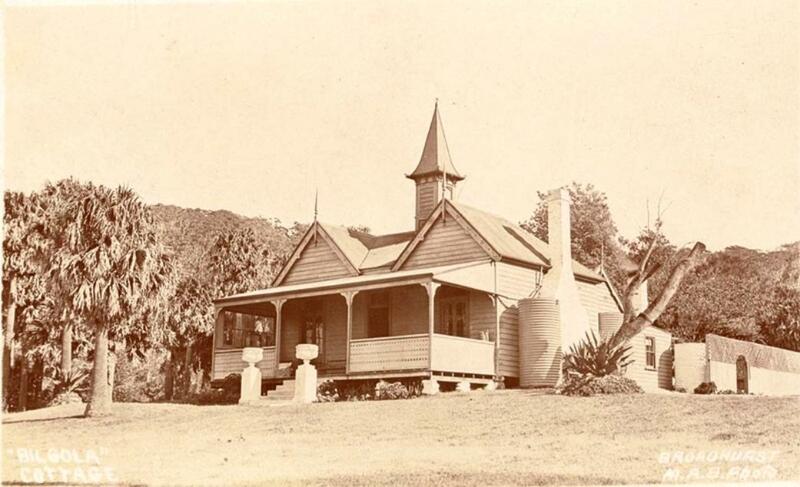 Hannah Maclurcan’s Bilgola estate passed to her son, Charles, and was eventually sold. However, the house that offered such comfort to W B Dalley, Oswald Watt, Hannah Maclurcan and others is, sadly, no longer with us. 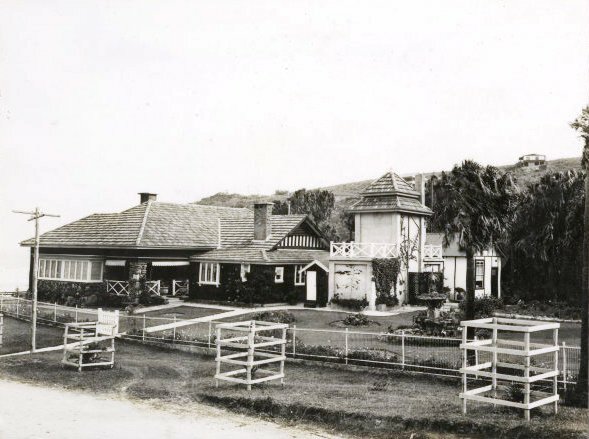 It was demolished in 1987, together with all the outbuildings, despite having been listed under Warringah Council’s draft provisions for the control of heritage buildings. The intention of the then owner was to erect townhouses on the site but community protest led to the rejection of this and subsequent plans. Today, five houses occupy the site and the present owners have been careful to preserve many of the heritage items – a grove of tall cabbage-tree palms, trees lining the avenue, the old entrance posts, dry stone walls bordering the creek, small bridge structures, lined garden beds, pedestals, wells, and even the flower urns on which the carved heads of Henry Parkes, John Robertson and William Dalley can still be discerned. Bilgola Cottage and House threads Collected and Collated by A J Guesdon, 2011. All Rights Reserved.